Was the Hawkins Hadrosaurus real? Hadrosaurus at the Academy of Natural Sciences. Photo from Weishampel and Young 1996. In the “Claosaurus” post earlier this week, I temporarily(?) lost my mind when I said that the Hadrosaurus Benjamin Waterhouse Hawkins assembled for the Academy of Natural Sciences was 100% plaster reconstruction. Thanks to John Sime, among others, for pointing out that this was incorrect. As usual, the truth is more complicated, and therefore much more interesting. The Hadrosaurus project began when Hakwins was commissioned to create a series of life-sized prehistoric animals for display in New York City’s central park, under the direction of Joseph Leidy. 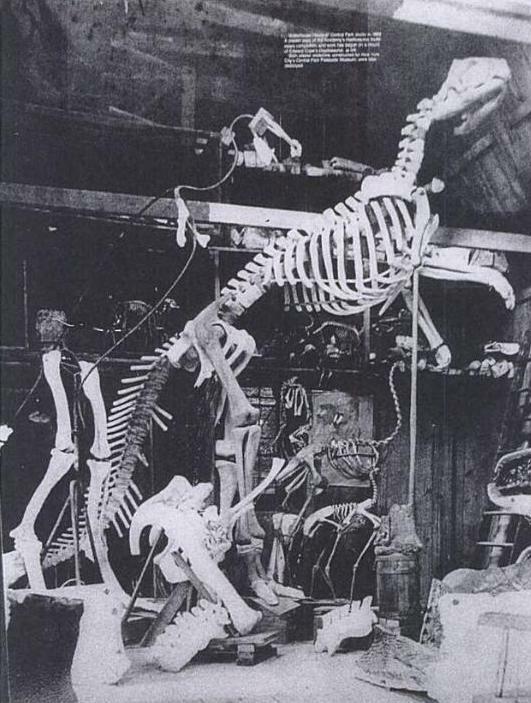 The exhibition was cancelled when Hawkins’ on-site workshop was burned down by vandals, but he was able to salvage the Hadrosaurus skeleton for display at the Academy in Philadelphia. This reconstruction was based on little more than two limbs and a handful of vertebrae. It was a well-reasoned attempt – and it drew huge crowds – but it wasn’t long before new dinosaur finds rendered it obsolete. In 1901, Charles Beecher wrote that the Hadrosaurus mount had “long since ceased to have any value or interest except as a historical attempt.” No longer considered informative, the original Hadrosaurus was probably dismantled around the start of the 20th century. At least three plaster copies were distributed to other museums, but these were also discarded long ago. The two letters reproduced below are in the collection of the Department of Vertebrate Paleontology Archives at the Peabody Museum of Natural History, and are shared with permission. Letter from Witmer Stone to Richard Lull, January 26, 1925. Courtesy of the Dept. of Vertebrate Paleontology Archives, Yale Peabody Museum of Natural History. Letter from William Matthew to Richard Lull, January 30, 1925. Courtesy of the Dept. of Vertebrate Paleontology Archives, Yale Peabody Museum of Natural History. A look at the original Hadrosaurus fossils, now cataloged as ANSP 10005, suggests that Matthew was correct. At least a couple of the bones appear to bear drill holes, a tell-tale sign that they were once fastened to an armature. Likewise, in a photograph of the mount in Hawkins workshop, the elements that were actually recovered – the left leg*, part of the pelvis, and a scattering of vertebrae – appear to be darker in color. This suggests that these are the real bones, and the rest of the skeleton is plaster…unless Hawkins painted plaster casts to demonstrate which elements had been found. *Note that the image below has been flipped horizontally for some reason. In the original, the left side of the skeleton is facing the camera. Hadrosaurus in Hawkins’ studio. Image from Carpenter et al. 1994. The answer to this little conundrum can be found in the official guidebook to the Academy of Natural Sciences, published in 1879. Apparently there were two versions of Hadrosaurus on display. The original 1868 mount did include the original fossils, but when the museum moved to a larger facility in 1876 (in part because of the spike in visitation caused by the Hadrosaurus exhibit) the mount was remade. The bones were not faring well in open air and were rapidly deteriorating, so they were retired to the collections and replaced with casts. Anyone who saw the Hadrosaurus before 1876 saw the fossils incorporated into the mount, and anyone who visited later saw a complete facsimile. Still, I’m pretty sure William Matthew was remembering incorrectly. He was born in 1871, so unless he was carefully observing the composition of the mount at age 5, he shouldn’t have seen the original version! Beecher, C.E. 1901. The reconstruction of a Cretaceous dinosaur, Claosaurus annectens Marsh. Transactions of the Connecticut Academy of Arts and Sciences. Vol. 11, pp. 311-324. Carpenter, K., Madsen, J.H. and Lewis, L. 1994. Mounting of Fossil Vertebrate Skeletons. Vertebrate Paleontological Techniques, Vol. 1. Cambridge, UK: Cambridge University Press. Prieto-Márquez, A., Weishampel D.B., and Horner J.R. 2006. The dinosaur Hadrosaurus foulkii, from the Campanian of the East Coast of North America, with a re-evaluation of the genus. Acta Palaeontologica Polonica. Vol. 51, pp. 77-98. Ruschenberger, W.S.W. and Tryon, G.W. 1879. Guide to the Museum of the Academy of Natural Sciences of Philadelphia. Philadelphia, PA: Academy of Natural Sciences. Weishampel. D.B. and Young, L. 1996. Dinosaurs of the East Coast. Baltimore, MD: The Johns Hopkins University Press. In 1868, paleontologist Joseph Leidy and artist Benjamin Waterhouse Hawkins collaborated on a freestanding mounted skeleton of Hadrosaurus. This was the first time dinosaur fossils had ever been displayed in this way, and the exhibit captured the public imagination like nothing before it. I’ve already written lots about the Hadrosaurus mount (see First Full-Sized Dinosaurs and A Visit to the Academy of Natural Sciences), but it seems there is still more to say. Hadrosaurus mount under construction in Hawkins’ studio. Image from Carpenter et al. 1994. 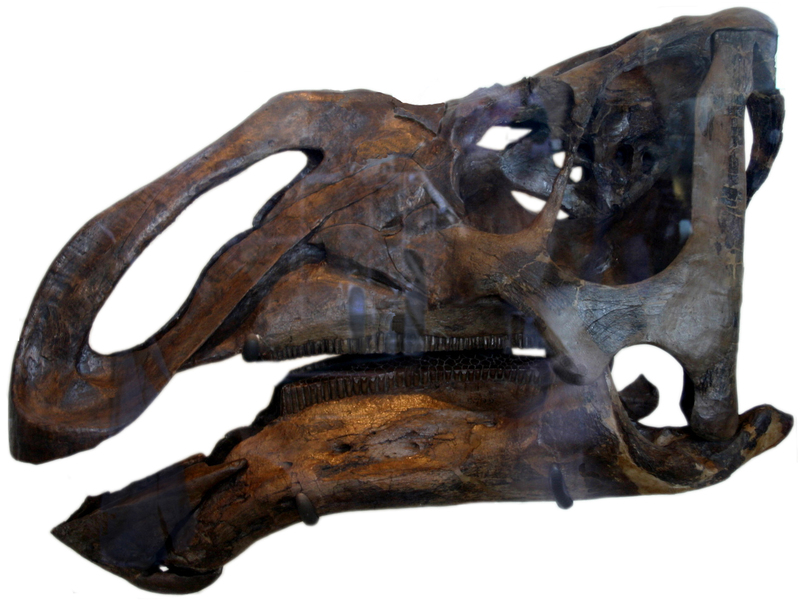 Today, I’m interested in the Hadrosaurus head, or rather, the sculpted replica that stood in for its head. As I’ve covered before, the Hadrosaurus fossils recovered near Haddonfield, New Jersey accounted for less than a third of the animal’s skeleton. With two nearly complete limbs, 28 vertebrae, a partial pelvis and scattered teeth, Hadrosaurus was the most complete dinosaur known at the time, but a great deal of it was still unknown. Specifically, Hawkins had to create a skull from scratch, and conventional wisdom (e.g. these articles) has always been that he based his reconstruction on the skull of an iguana. That makes a certain amount of sense, since Leidy interpreted the Haddonfield teeth as having belonged to an herbivore, and an iguana is a contemporary herbivorous reptile. Hadrosaurus teeth and dentary (plus some Astrodon teeth on the lower left). From Leidy 1865. Let’s explore that claim a little more, though. The plate above presumably represents the entirety of the Hadrosaurus cranial material Leidy and Hawkins had to work with. In addition to an assortment of isolated teeth, they had two sections of a dental battery – that is, the grinding surface made up of interlocking teeth that we now know is typical of large ornithopods. One of the battery portions came from the lower jaw (Figs. 24 and 25) and one came from the upper (Fig. 26). 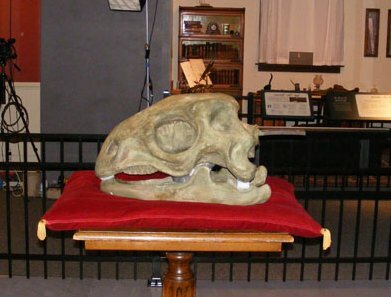 The sculpted Hadrosaurus skull, which Academy of Nautral Sciences Associate Curator Ted Daeschler confirms is the only surviving part of the historic mount, is pictured below. Note that Hawkins plainly incorporated the dental batteries into his reconstruction, rather than straight rows of iguana-style teeth. So in at least one detail, the Hadrosaurus model skull is not just a scaled-up version of an iguana. The thing is, though, now that I’m really looking at it, the model doesn’t look much like an iguana skull at all beyond the basic silhouette. Look at that broadly flared jugal, the strongly curved postorbital and especially the way the premaxilla and maxilla curve downward in a beakish fashion. 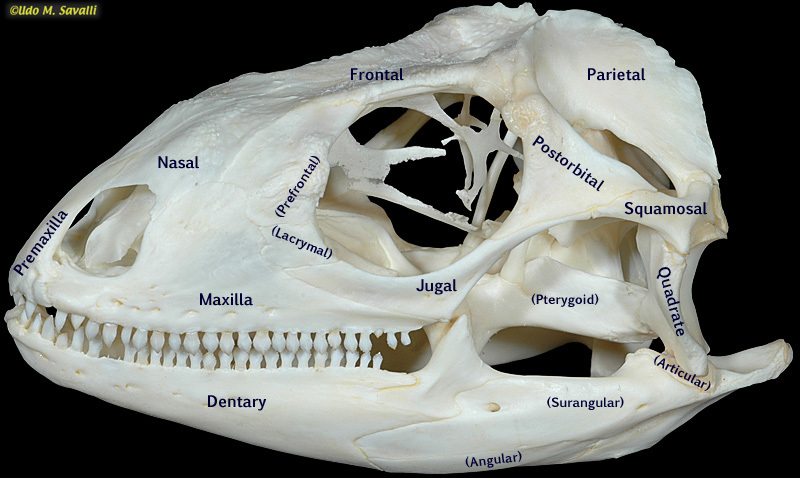 None of these characteristics are present on your run-of-the-mill iguana skull, but they are so extreme and precisely modeled that I would be very surprised if expert anatomists like Leidy and Hawkins simply invented them. Labeled Iguana iguana skull by Udo Savalli. What does this mean? There are a few options. Hawkins and Leidy didn’t closely reference anything when creating the Hadrosaurus skull, and just made something up. Hawkins and Leidy based the Hadrosaurus skull on some contemporary reptile other than a green iguana. Hawkins and Leidy had more Hadrosaurus cranial fossils than we know about. Option three is, of course, the interesting one, and is where I would appreciate if any actual hadrosaurid experts in the house would let me know if I’m talking nonsense. But don’t those peculiar non-iguana-like characters on the sculpted Hadrosaurus skull look just a bit like the actual hadrosaurid skulls that would be found in the 20th century? Kritosaurus skull at AMNH. Photo by WikiMedia user Ryan Somma. That downward-tilting rostrum in particular looks suspiciously similar. Is it possible that there was a more complete Hadrosaurus skull at the Haddonfield site, but it was lost or destroyed before Leidy’s publication? Maybe it was considered too fragmentary to collect and was left in the field, or maybe it fell apart in transit (J.B. Hatcher hadn’t invented field jacketing yet). Hawkins might have attempted to interpret sketches or hazy descriptions of lost material, and ended up with the model skull that survives today. I realize that this isn’t much to go on, and that it’s impossible to prove without some thorough archival research. But it is cool to think that maybe, just maybe, there was a bit more to the first American dinosaur than we known about. Carpenter, K., Madsen, J.H. and Lewis, L. (1994). 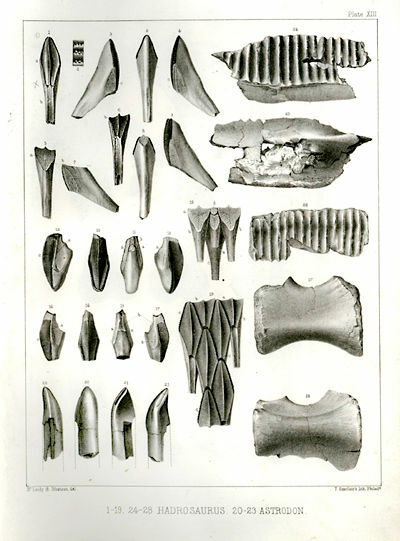 “Mounting of Fossil Vertebrate Skeletons.” In Vertebrate Paleontological Techniques, Vol. 1. Cambridge, UK: Cambridge University Press. Leidy, J. (1865). “Cretaceous Reptiles of the United States.” Smithsonian Contributions to Knowledge Vol. 14, Article VI. Last time, we covered how Albert Koch turned a tidy profit with his less-than-accurate fossil mounts, leading credible paleontologists to avoid involvement with full-sized reconstructions of extinct animals for much of the 19th century. With the exceptions of Juan Bautista Bru’s ground sloth and Charles Peale’s mastodon, all the fossil mounts that had been created thus far were horrendously inaccurate chimeras assembled by often disreputable showmen. Serious scientists were already struggling to disassociate themselves from these sensationalized displays of imaginary monsters, so naturally they avoided degrading their work further by participating in such frivolous spectacle. The prevailing negative attitude toward fossil mounts among academics would begin to shift in 1868, when paleontologist Joseph Leidy and artist Benjamin Waterhouse Hawkins collaborated on a mount of Hadrosaurus, the first dinosaur to be scientifically described in America and the first dinosaur to be mounted in the world. While prehistoric animals were well known by the mid-19th century, the Hadrosaurus was so bizarre, so utterly unlike anything alive today, that it truly opened people’s eyes to the unexplored depths of the Earth’s primordial history. I have written about the Hadrosaurus mount before, but its creation was such a landmark event in the history of paleontology and particularly the public understanding of prehistory that it deserves to be contextualized more thoroughly. In the early 1800s, American fossil hunters were busy poring over the bones mammoths, mastodons and other mammals. Across the Atlantic, however, it was all about reptiles. Scholars were pulling together the first cohesive history of life on earth, and Georges Cuvier was among the first to recognize distinct periods in which different sorts of creatures were dominant. There had been an Age of Mammals in the relatively recent past during which extinct animals were not so different from modern megafauna, but it was preceded by an Age of Reptiles, populated by giant-sized relatives of modern lizards and crocodilians. The marine ichthyosaurs and plesiosaurs unearthed by Mary Anning on the English coast were the first denizens of this era to be thoroughly studied, but they were soon followed by discoveries of terrestrial creatures. In 1824, geologist William Buckland received a partial jaw and a handful of postcranial bones found in the Oxfordshire shale. Recognizing the remains as those of a reptile, Buckland named the creature Megalosaurus, making it the first scientifically described non-avian dinosaur (honoring the unspoken agreement to ignore “Scrotum humanum”). 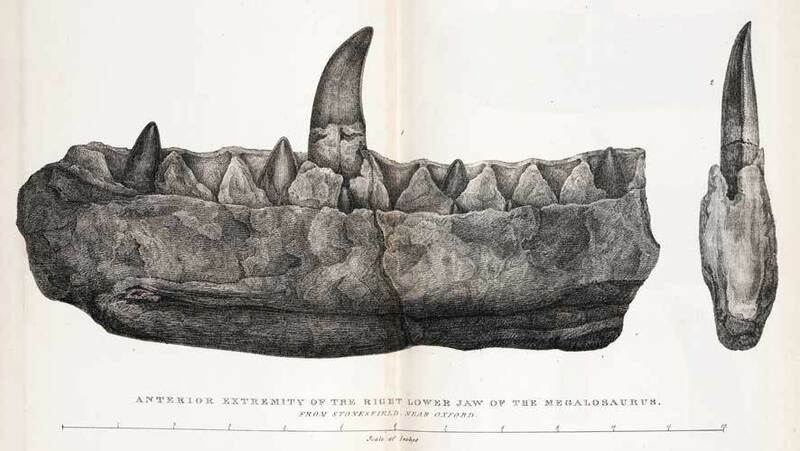 The partial jaw of Megalosaurus, the first named dinosaur. Of course, the word “dinosaur” did not yet exist. As covered by virtually every text ever written on paleontological history, it was anatomist Richard Owen who formally defined Dinosauria in 1842 as a distinct biological group. Owen defined dinosaurs based on anatomical characteristics shared by Megalosaurus and two other recently discovered prehistoric reptiles, Iguanodon and Hylaeosaurus (fatefully, and somewhat arbitrarily, he excluded pterosaurs and doomed paleontologists and educators to forever reminding people that pterodactyls are not dinosaurs). In addition to being an extremely prolific author (he wrote more than 600 papers in his lifetime), Owen was a talented publicist and quite probably knew what he was unleashing. The widely publicized formal definition of dinosaurs, accompanied by displays of unarticulated fossils at the Glasgow Museum, was akin to announcing that dragons were real. By giving dinosaurs their name, Owen created an icon for the prehistoric past that the public could not ignore. “Dinosaur” soon became the word of the day in Victorian England. Looking to capitalize on this enthusiasm for paleontology, the Crystal Palace Company approached Owen in 1852 to oversee the creation of an unprecedented new exhibit. The company was building a park in the London suburb of Sydenham, meant to be a permanent home for the magnificent Crystal Palace, which had been built the previous year for the Great International Exhibition of the Works and Industry of All Nations. 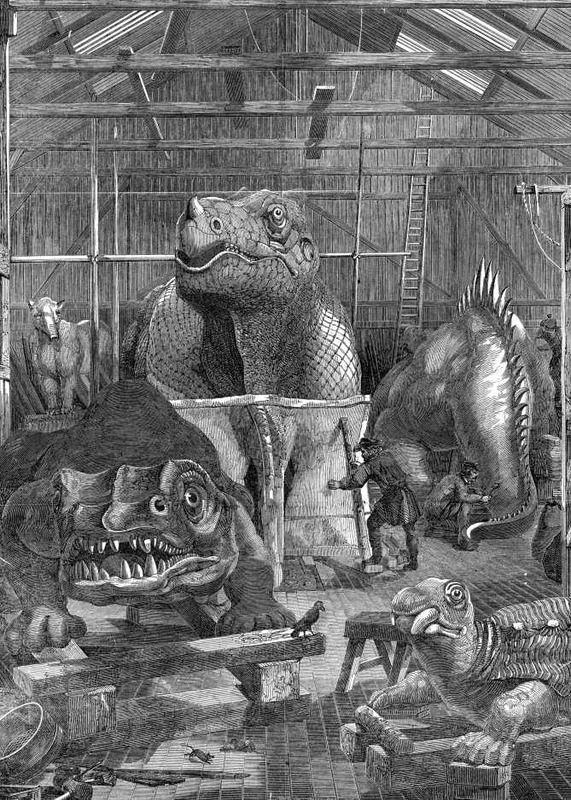 Concerned that the palace would not draw visitors to the park on its own, the Crystal Palace Company commissioned Owen and scientific illustrator Benjamin Waterhouse Hawkins to create a set of life-sized sculptures of dinosaurs and other prehistoric creatures, the first of their kind in the world. The sculptures were a tremendous undertaking: the Iguanodon, for instance, was supported by four 9-foot iron columns, and its body was built up with brick, tile and cement. Hawkins then sculpted its outer skin from more than 30 tons of clay. All told, more than a dozen animals were built, including Megalosaurus, Iguanodon, Hylaeosaurus and an assortment of marine reptiles and mammals. The Crystal Palace dinosaurs under construction in Hawkin’s studio. Queen Victoria herself presided over the opening ceremony of Crystal Palace Park in 1854, which was attended by 40,000 people. This was an important milestone because up until that point, only the broadest revelations in geology and paleontology made it out of the academic sphere. But as Hawkins himself put it, the Crystal Palace dinosaurs “might be properly described as one vast and combined experiment of visual education” (Hawkins 1853, 219). The general public could see firsthand the discoveries and conclusions of the most brilliant scientists of their age, in a format that could not only be readily understood and appreciated, but experienced. Full-sized reconstructions of prehistoric animals, including fossil mounts, continue to be built today for precisely this reason. While the Crystal Palace dinosaurs are important historic artifacts and beautiful works of art in their own right, they have not aged well as accurate reconstructions. Owen only had the scrappiest of dinosaur fossils to work with, enough to conclude that they were reptiles and that they were big but not much else. As a result, the Megalosaurus and Iguanodon sculptures look like rotund lizards, as though a monitor lizard or iguana gained the mass and proportions of an elephant. By modern standards, these beasts look pretty ridiculous as representations of dinosaurs, but they were quite reasonable given what was known at the time, at least for a few years. And so at last Hadrosaurus enters the story. Just four years after the unveiling of the Crystal Palace sculptures, the first American dinosaur was found on a farm near Haddonfield, New Jersey (dinosaur footprints and teeth had been found earlier, but their affinity with the European reptiles was not recognized until later). William Foulke, a lawyer and geology enthusiast affiliated with the Philadelphia-based Academy of Natural Sciences, was at his winter home in Haddonfield when he paid a visit to his neighbor, John Hopkins. Hopkins told Foulke that he occasionally found large fossils on his land, which he generally gave away to interested friends and family members. With Hopkins’ permission, Foulke searched the site where the fossils had been found with the assistance of paleontology and anatomy specialist Joseph Leidy. Also a member of the Academy of Natural Sciences, Leidy is considered the founder of American paleontology and during the mid-1800s, he was the preeminent expert on the subject. At the Haddonfield site, Foulke and Leidy uncovered approximately a third of a dinosaur skeleton, including two nearly complete limbs, 28 vertebrae, a partial pelvis, scattered teeth and two jaw fragments. All known Hadrosaurus fossils, presently on display at the Academy of Natural Sciences. Now in possession of the most complete dinosaur skeleton yet found, Leidy began studying the fossils of what he would name Hadrosaurus foulkii (Foulke’s bulky lizard) in Philadelphia. The teeth in particular told Leidy that Hadrosaurus was similar to the European Iguanodon. Like Iguanodon, Hadrosaurus was plainly an herbivore, and for reasons left unspecified Leidy surmised that it was amphibious, spending most of its time in freshwater marshes. Leidy noted that Hadrosaurus was a leaner and more gracile animal than Owen’s Crystal Palace reconstructions, but he was particularly interested in “the enormous disproportion between the fore and hind parts of the skeleton” (Leidy 1865). 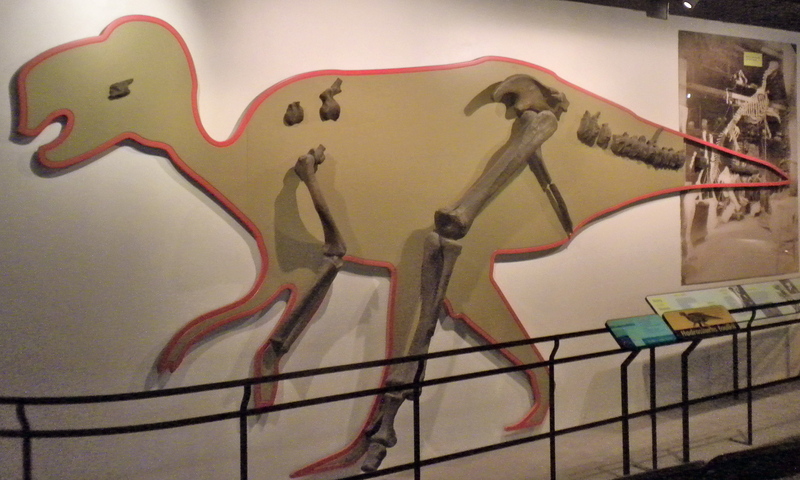 Given the large hindlimb and small forelimb, Leidy reasoned that Hadrosaurus was a habitual biped, and likened its posture to a kangaroo, with an upward-angled trunk and dragging tail. As such, we can credit Leidy for first envisioning the classic Godzilla pose for dinosaurs, which has been known to be inaccurate for decades but remains deeply ingrained in the public psyche. Although the new information gleaned from Hadrosaurus made it clear that the Crystal Palace sculptures were hopelessly inaccurate, Leidy had been impressed by the Sydenham display and wanted to create a similar public attraction in the United States. Leidy invited Hawkins to prepare a new set of prehistoric animal sculptures for an exhibit in New York’s Central Park. Hawkins set up an on-site studio and began constructing a life-sized Hadrosaurus, in addition to a mastodon, a ground sloth and Laelaps, another New Jersey dinosaur. Unfortunately, Hawkins’ shop was destroyed one night by vandals, apparently working for corrupt politicians. What remained of the sculptures was buried in Central Park and the exhibit was cancelled. Edit 4/20/2017: Leidy was not actually involved in planning the ill-fated Central Park display. Thanks to Raymond Rye for the tip! Instead of abandoning the project entirely, Hawkins and Leidy redirected the resources they had already prepared for the Central Park exhibit into a display at the Academy of Natural Sciences museum in Philadelphia. Leidy decided he wanted a mounted skeleton of Hadrosaurus, rather than a fully fleshed model as was originally planned. Such a display had not appeared in a credible museum since Charles Peale created his mastodon mount, but if anybody could get a fossil mount to be taken seriously, it was Leidy. 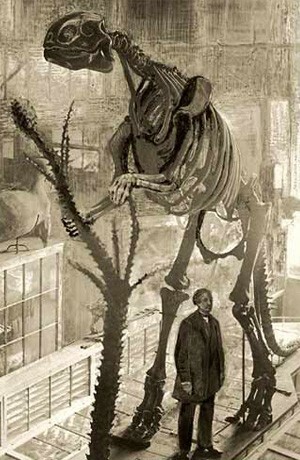 With only a partial Hadrosaurus skeleton to work with, Hawkins had to sculpt many of the bones from scratch, in the process inventing many of the mounting techniques that are still in use nearly a century and a half later. For instance, Hawkins created mirrored duplicates of the left limb bones for use on the animal’s right side, and reconstructed best-guess stand-ins for the skull, scapulae and much of the spinal column using modern animals as reference. Based on photographs like the one below, it appears that portions of the vertebral column were cast as large blocks, rather than individual vertebrae. The mount was supported by a shaped metal rod running through the vertebrae, as well as a single vertical pole extending from the floor to the base of the neck. In fact, very little of the armature appears to have been externally visible, suggesting that making the skeleton as aesthetically clean as possible was a priority. Hadrosaurus under construction in Hawkins’ studio. Note the flightless bird mounts used for reference. From Carpenter et al. 1994. The Hadrosaurus mount had a few eccentricities that are worth noting. First, the mount has seven cervical vertebrae, which is characteristic of mammals, not reptiles. Likewise, the scapulae and pelvis are also quite mammal-like. Hawkins was apparently using a kangaroo skeleton as reference in his studio, and it is plausible that this was the source of these mistakes. In addition, Hawkins had virtually no cranial material to work with (despite several repeat visits to the Haddonfield site by Academy members searching for the skull), so he had to make something up. He ended up basing the his sculpted skull on an iguana, one of the few exclusively herbivorous reptiles living today. Although fossils of Hadrosaurus relatives would later show that this was completely off the mark, it was very reasonable given what was known at the time. The Hadrosaurus mount was unveiled at the Academy of Natural Sciences musuem in 1868, and the response was overwhelming. The typical annual attendance of 30,000 patrons more than doubled that year to 66,000, and the year after that saw more than 100,000 visitors. Traffic levels were so high that the Academy had to decrease the number of days it was open and enforce limits on daily attendance in order to prevent damage to the rest of the collection. Soon, the Academy was forced to relocate to a new, larger building in downtown Philadelphia, which it still occupies today. The audience for the Hadrosaurus mount was expanded greatly in the 1870s by three plaster copies of the skeleton, which were sent to Princeton University in New Jersey, the Smithsonian Institution in Washington, DC and the Royal Scottish Museum in Edinburgh (the first dinosaur mount displayed in Europe). The Smithsonian copy had a particularly mobile existence: it was first displayed in the castle on the south side of the National Mall, moved to the dedicated paleontology display in the Arts and Industries Building around 1890, and finally traded to the Field Museum in Chicago later in the decade. 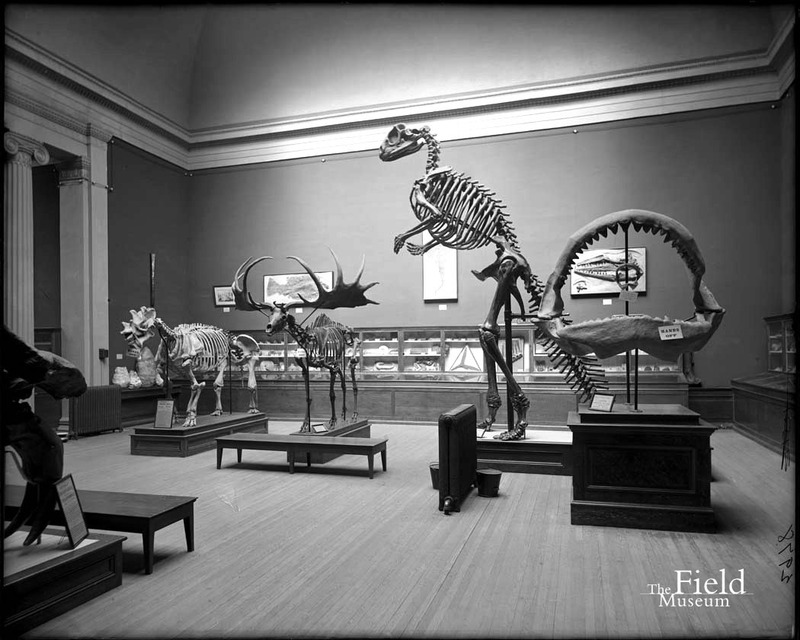 In Chicago, the Hadrosaurus was displayed in a spacious gallery alongside mounts of Megaloceros and Uintatherium, and it is in this context that the best surviving photographs of the Hadrosaurus mount were taken. Sadly, by the early 1900s all three casts had been destroyed or discarded by their host institutions, since they had either deteriorated badly or were deemed too inaccurate for continued display. The original Philadelphia mount was also dismantled, although the Hadrosaurus fossils are still at the Academy. Hadrosaurus cast on display at the Field Museum. Field Museum Photo Archives. Why was the Hadrosaurus mount such a big deal? For one thing, it was different from previous fossil mounts in that it was the product of the best scientific research of the day. This was not the work of a traveling showman but a display created by the preeminent scientific society of the era, with all the mystique and prestige that came with it. Most importantly, however, the Hadrosaurus mount presented the first ever opportunity to stand in the presence of a dinosaur. By the mid-19th century, western civilization had had ample opportunity to come to terms with the fact that organisms could become extinct, but for the most part the fossils on display were similar to familiar animals like horses, elephants and deer. The Hadrosaurus, however, was virtually incomparable to anything alive today. It was a monster from a primordial world, incontrovertible evidence that the Earth had once been a very different place. 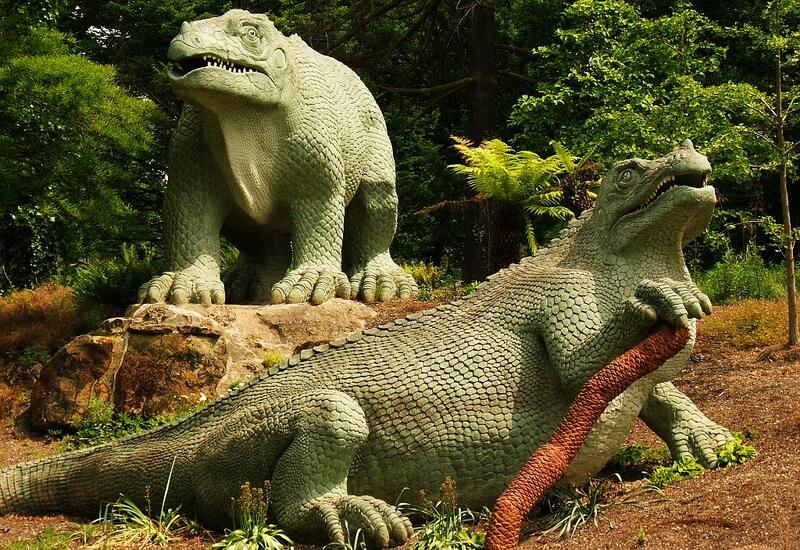 By comparison, the Crystal Palace sculptures were essentially oversized lizards, and therefore fairly relateable. The Hadrosaurus was the real turning point, the moment the public got their first glimpse into the depths of prehistory. For 15 years, the Hadrosaurus was the only real dinosaur on display anywhere in the world, so it is no wonder that people flocked to see it. Of course, the Hadrosaurus was only the beginning of the torrent of dinosaur fossils that would be unearthed in the late 19th century. It would prove to be but a hint at the amazing diversity and scale of the dinosaurs that would be revealed in the American west, as well as the scores of fossil mounts that would soon spring up in museums. Leidy, J. (1865). “Cretaceous Reptiles of the United States.” Smithsonian Contributions to Knowledge. 14: 1-102. Waterhouse Hawkins, B. (1853). “On Visual Education as Applied to Geology.” Journal of the Society of Arts. 2: 444-449. I spent yesterday in Philadelphia, my first visit in at least 10 years, and of course made a point of visiting the Academy of Natural Sciences. Founded in 1812, the Academy is the oldest natural science research institution and museum in North America, established “for the encouragement and cultivation of the sciences, and the advancement of useful learning.” Initially formed as a hub for research on the American frontier, the Academy has sponsored scientific expeditions across the world and has amassed a collection of 17 million specimens that is still actively used 200 years after its founding. In 1868, the Academy museum made a landmark contribution to paleontology by hosting the first mounted dinosaur skeleton ever constructed. The mount, the work of paleontologist Joseph Leidy and sculptor Benjamin Waterhouse Hawkins, depicted Hadrosaurus foulki, the first dinosaur discovered in North America and at the time the most complete dinosaur ever found. With only two limbs, a section of the spinal column and some other odds and ends to work with, Hawkins invented many of the mounting techniques that are still in use today. For instance, Hawkins created mirrored duplicates of the left limb bones for use on the animal’s right side, and reconstructed best-guess stand-ins for the skull, scapulae and most of the vertebrae using extant animals as reference. By modern standards, the Leidy-Hawkins Hadrosaurus mount wasn’t especially accurate (the sculpted scapulae and vertebrae resemble those of a mammal, not a reptile; the skull, based on that of an iguana, turned out to be completely off the mark; the fully upright, kangaroo-like posture is now known to be anatomically implausible), but it nevertheless presented the first-ever opportunity to stand in the presence of a dinosaur. Extinct animals were already known to the public, and some had even been mounted, but the Hadrosaurus was so bizarre, so utterly unlike anything alive today, that it really opened people’s eyes to the unexplored depths of the Earth’s primordial history. 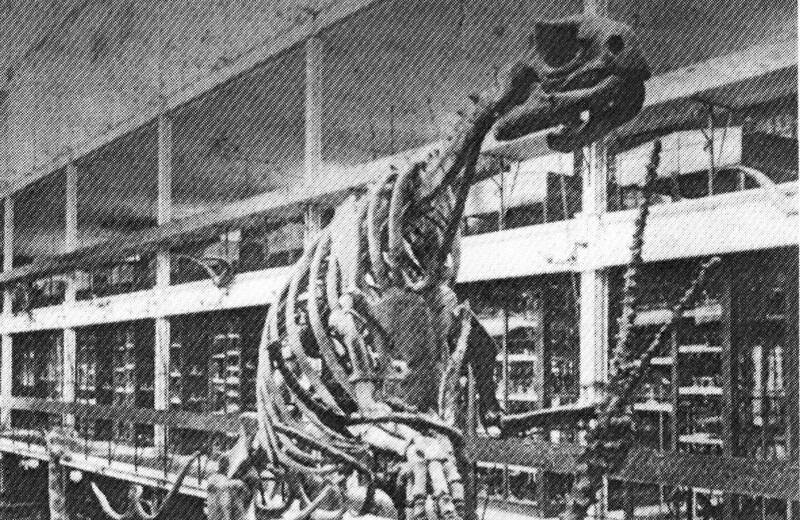 The Hadrosaurus display caused public visitation to skyrocket, prompting the Academy to relocate in 1876 to a larger building in central Philadelphia, where it remains today. I haven’t been able to find any photographs or detailed information about it, but for much of the 20th century the Academy had a fossil exhibit with a Corythosaurus mount as its centerpiece. This was replaced in 1986 with an expanded “Discovering Dinosaurs” exhibit, which apparently was among the first to showcase the discoveries of the dinosaur renaissance. This exhibit has just about zero web presence, as well (seriously, any help tracking down details about it would be greatly appreciated). The current version of the Dinosaur Hall opened in 1998, and is what I will discuss below. This cast of the AMNH Tyrannosaurus is the centerpiece of the Dinosaur gallery. Source: Wikipedia Commons. Although crammed into a fairly small space, the Academy’s two-level Dinosaur Hall is packed with mounts of North American fossil reptiles, including Tyrannosaurus, Chasmosaurus, Deinonychus, Tylosaurus, Pachycephalosaurus and many more. Compared to the sterile and coldly scientific displays at larger museums like the American Museum of Natural History, the Academy’s exhibit designers clearly put an emphasis on accessibility, particularly for younger visitors. Signs are attractive, colorful and use simple language, but do not sacrifice scientific accuracy. Although “Do Not Touch” notices abound, guardrails are low and allow visitors to view the mounts up close. Even the fossil prep lab, a staple in paleontology exhibits, is not behind glass but is separated from visitors by a low wall, allowing guests to converse freely with the preparators if they so choose (This might not be so fun for the preparators; I’ve worked in a couple of these labs and I’ll be the first to admit that our conversations are not always for public ears). The Academy’s Dinosaur Hall is also filled with interactive activities. I question the educational value of a green-screen that places visitors into a scene with dinosaurs running around (the last thing we need is to encourage more people to think humans and dinosaurs coexisted), but many of the other interactives are quite inspired. In one corner, children are encouraged to climb inside a Tyrannosaurus skull cast to find evidence for its diet and lifestyle. Crouching between its jaws, kids find partially-erupted teeth, evidence that the predator broke and regrew teeth throughout its life. My favorite interactive, however, featured parallel rows of theropod and crocodile footprints on the floor. Visitors were directed to walk down each trackway, comparing how it felt different to move with an upright or sprawling gait. At the end, a sign explained that it’s harder, and less energy efficient, to move like a crocodile. I loved this activity because it was simple (just images on the floor, no technology required) and yet conveyed a clear explanation of biomechanics. Visitors use their own bodies to reach the conclusion, finding the answer in a tactile and experiential way that is more memorable than just being told that a sprawling posture is inefficient. Overall, the Dinosaur Hall is a great overview of dinosaur science. It focuses on the biology of dinosaurs, emphasizing their similarity to animals we know today, and how scientists can draw conclusions about past life by studying the modern world. This content is communicated in a way that is clear and engaging for visitors of all ages, making this exhibit a good example of the old adage that all good science can be explained in simple terms. When I visited, there were a couple children using the open exhibits like a playground, but for the most part I think this highly accessible dinosaur exhibit is quite successful. The Academy’s Dinosaur Hall is 15 years old, and is in some places showing its age. Some of the exhibit content is not entirely up-to-date; for instance, a display on the relationship between birds and dinosaurs leaves the question completely open ended. I also saw at least two invalid names, “Majungatholus” and “Ultrasauros”, used on labels. Probably more obvious to most visitors is the general wear and tear visible in certain parts of the exhibit. Some labels, particularly those facing large windows, are badly faded. The Elasmosaurus mount was moved from the Dinosaur Hall proper to the entrance lobby at some point, but Elasmosaurus signage, now labeling an empty space, is still in place in the exhibit. I got the impression that the Academy, like much of Philadelphia, is hurting for funding. Corythosaurus and Chasmosaurus mounts. Source: TravelMuse. The story of Leidy’s Hadrosaurus appears in several places throughout the museum. Casts of the original fossil material are displayed over a silhouette of the dinosaur toward the back of the Dinosaur Hall. Elsewhere , there is a new full casted mount of Hadrosaurus (signs explain that it is filled in with Maiasaura material), and the original tibia is displayed as part of a rather cool 200th Anniversary special exhibit. At the time, I wished that these displays were consolidated in one place, since the Hadrosaurus story is an important chapter in the history of science and of museums that can be seen exclusively at the Academy. 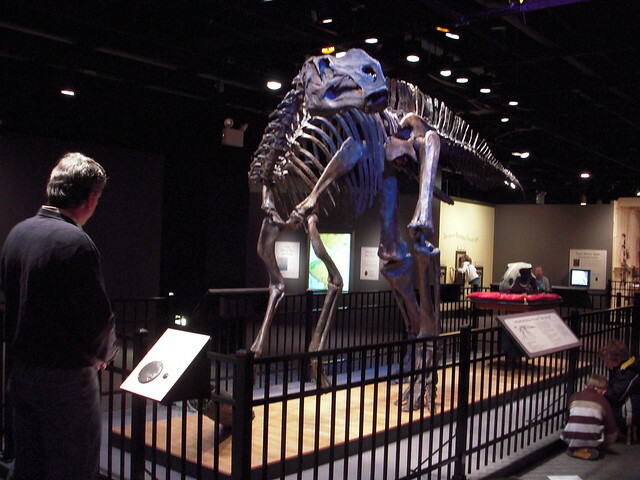 I later found out that in 2008, the Academy had a major temporary exhibit commemorating the 150th anniversary of the original Hadrosaurus mount, which featured, among other things, a recreation of the victorian-era exhibit and the workshop of Benjamin Waterhouse Hawkins (great videos and interviews about the exhibit here). I wish I had been able to see that, because it blends the scientific, cultural and historic value of fossil mounts in a way that only this museum can. The sadly closed Hadrosaurus Anniversary exhibit. Note Hawkins’ original sculpted head on the red pillow. Source: The Art Blog. 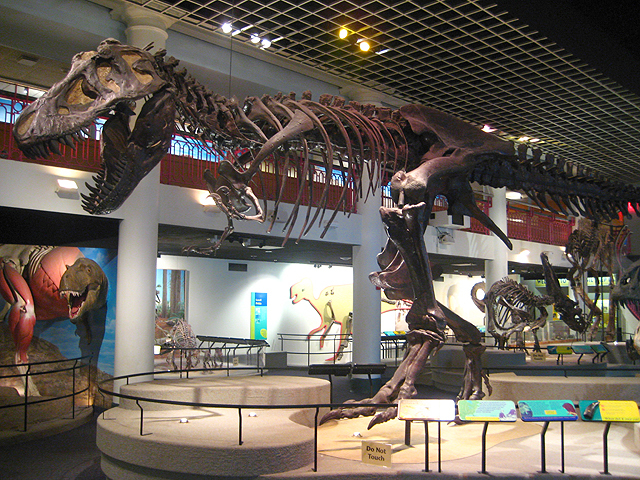 The current centerpiece of the Dinosaur Hall is a cast of the AMNH Tyrannosaurus. It’s neat, but I imagine most visitors would be more enthused to see the real one just a couple hours down the road. Indeed, most of the dinosaurs on display at the Academy are casts from other institutions. I have no problem with displaying casts, but I can’t help but feel that this generalized dinosaur exhibit is underselling the Academy’s own fossil collections, not to mention its contributions to paleontology. Should the Academy renovate this space again, I’d love to see the institutions’ unique history play a more prominent role, as well as the work that Academy-affiliated researchers are doing today.